Vizio Inc, well known for their great quality, lower priced HDTV’s, has announced they are going to take on the PC manufacturers with all-in-one and thin laptops at “a price that just doesn’t seem possible“. See the interview with Vizio’s Chief Technology Officer Matt McRae over at Bloomberg, and checkout the image gallery of the 24-inch All-in-One PC, 27-inch All-in-One PC, 14-inch Thin + Light Notebook, 15.6-inch Thin + Light Notebook, 15.6-inch Notebook over at Engadget. This could really be a great thing! I’m wanting a thin laptop, but I think they’re too expensive. Vizio might bring some sanity to the market. 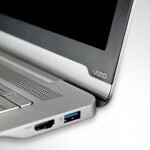 Vizio will unveil two desktop PCs and three notebooks at the Consumer Electronics Show in Las Vegas next week.